TileWindows Lite if the FREE version of TileWindows and it helps you to easily organize your desktop: Move and resize your application windows, so you can view them side by side, by using keyboard shortcuts. Do you have a big screen with high resolution? Start using it! TileWindows Lite helps you to place your windows on the screen in a way that let's you take full advantage of it. It's time to work more efficiently with the help of TileWindows Lite now. Buy TileWindows Lite and save lots of your time. 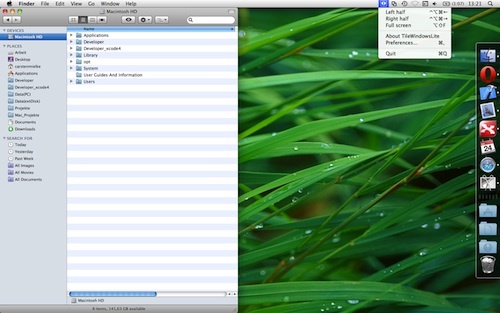 Resize and move a window to fill the Left half of the screen. 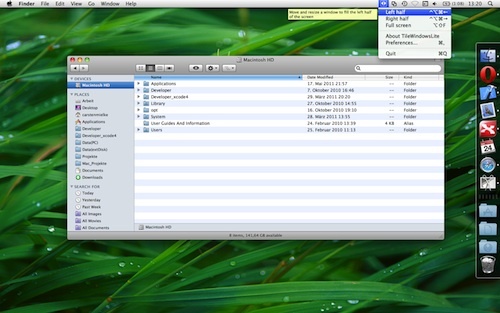 Resize and move a window to fill the Right half of the screen. Resize a window to fill the entire screen. 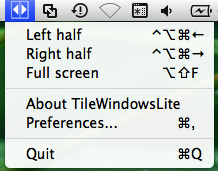 TileWindows Lite is an application whose functions can either be used by shortcuts or by the menubar. To bring a window to the left half of the screen, press the key combination Shift+Option(alt)+Command+Left Arrow, or use the menu. 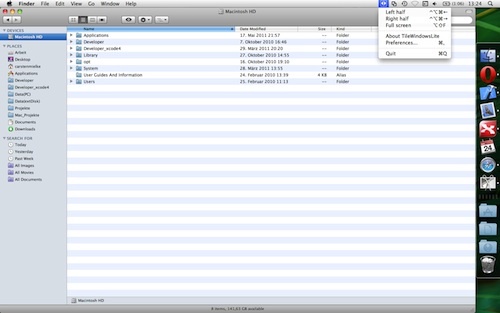 If you are experiencing that the shortcuts are not working, some other programs might use the same key combinations. You can find out if this is the case by logging on to your Mac with all programs closed, open a finder window, start TileWindows Lite and try the shortcuts. Alternatively try to change the key combinations manually.